The wait for overhauled MacBook Pros is over, so let the shakeup begin. This entry-level 13-inch MacBook Pro with a 2GHz Core i5 and function keys is a great replacement for my 13-inch MacBook Air. Whether it’s powerful enough for MacBook Pro power users is another story, and depends on your exact needs. It does have some significant trade-offs compared to the 13-inch and 15-inch MacBook Pros with Apple’s new Touch Bar, which I think is the more compelling purchase, at least this cycle. After using it for a little over a week, this entry level model feels more like an itertion of the 12-inch MacBook or 13-inch MacBook Air than a true successor to the MacBook Pro. Physically, the MacBook Pro got a pretty dramatic overhaul, even though this model keeps the row of function keys along the top of the computer. The MacBook Pro is thinner and lighter than previous generations—this one weighs just a hair over 3 pounds. While weight savings are always welcome, I would rather have a thicker laptop with a better keyboard than a computer this thin with keys that barely travel. Apple should optimize the experience of actually using the Mac, not just of carrying it around. Yep, it’s thin. Personally, I’d trade a little extra thickness for a better keyboard, but that isn’t an option. The keyboard uses the new butterfly-switch mechanism Apple introduced in the 12-inch MacBook in 2015, with low-profile, low-travel keys. Apple says this is the second generation of these switches; the company used different materials in an attempt to improve the feel, even though the keys don’t actually travel any farther. In practice, though, I can’t tell the difference between this and the first-gen MacBook keyboard. I can type on both just fine, but I’m not a fan of this style—every time I had to switch back to my MacBook Air for a few minutes, its old keyboard felt better immediately. With the MacBook Pro’s new keyboard, I find myself typing extra hard, like my brain isn’t convinced the keys are even going to go down unless I really pound them. For what it’s worth, I don’t have this problem with Apple’s wireless Smart Keyboard. Below the keyboard, the Force Touch trackpad is just huge. Apple says it’s 46 percent bigger than the trackpad on last year’s MacBook Pros. It might be too big—I find that my thumbs accidentally brush it while I type sometimes, if I’m not maintaining good typing posture, and when that happens the cursor will fly up a couple of lines, so suddenly I’m typing in the middle of another word. Apple says it worked on palm rejection when expanding the trackpad’s size to avoid this problem, but when it doesn’t work perfectly, it’s quite frustrating. I’m trying to train myself to keep better hand position when typing, which should help. Apple’s illustration shows off the new, more powerful speakers. Apple overhauled the speaker system in the MacBook Pro, and it’s significantly louder. I can stream a track from Soundcloud with the volume set to about 75 percent, and it’s plenty loud enough to fill my bedroom with music. I’m not even drowning it out when I pound on the low-travel keyboard. The 3.5mm headphone jack is still on every MacBook Pro model this year, in case you were worried it would vanish like it did from the iPhone 7. While I exclusively use this port to connect headphones, it’s also an audio-in/out for connecting mics or instruments. The beautiful Retina display is still the best reason to buy an Apple laptop. This 13-inch MacBook Pro has a native resolution of 2560x1600 at 227 pixels per inch, and uses a new oxide TFT panel that’s 67 percent brighter (up to 500 nits), with a 67 percent greater contrast ratio, than in the previous generation. It supports the wider P3 color gamut, which before was only available in the 4K and 5K Retina iMacs. The display looks terrific, and I’m glad Apple’s gone full-Retina across the 2016 MacBook lineup. Apple says that the brighter screen is more power efficient—using 30 percent less energy—thanks in part to a larger pixel aperture and variable refresh rate. In fact, the screen saves so much power, Apple decided to actually put in a smaller battery in watt-hours. Again, could the company have achieved a better overall experience by optimizing for longer battery life over space savings? Maybe, but we’ll never know. I wasn’t shocked that Apple went with Thunderbolt 3 ports (which use the USB-C form-factor) instead of the complement of ports found on previous generations. The writing was on the wall, after all, when the company put a single USB-C port on its 2015 and 2016 MacBooks, and at least the market for adapters and docks is more mature now than it was then. Actually, I think it’s a good move. Every MacBook Air and MacBook Pro I’ve used had a wider variety of ports, but I never used them all. With the new MacBook Pros, the Thunderbolt 3 ports can be used for Thunderbolt devices or for USB-C/USB 3.1 devices, as well as a whole host of options that used to be built in, provided you have the right adapter. So in a way, you get to select the exact mix of ports you need, since any open port can serve whatever purpose you need it to. The MacBook Pro’s ports support USB-C and Thunderbolt 3, and you can add adapters and docks to provide any other ports you might need while waiting for the industry to adopt USB-C more widely. But it’s still annoying to have to buy adapters, and carry adapters in your bag, and look at adapters hanging off the side of your laptop. Still, in my week with the MacBook Pro, I haven’t had occasion to plug in more than the charging cable with any kind of regularity. The problem with this entry-level MacBook Pro, without the Touch Bar, is that it has two Thunderbolt ports, while both sizes of Touch Bar MacBook Pro have four. Now, my own experience leads me to believe that two would be enough for me. I never connect to more than one external display, for example, and if I can charge via one port and have the other free for a display or peripherals, I’m good. Both this model and the 13-inch MacBook Pro with Touch Bar can drive the built-in display as well as one 5K monitor or two 4K monitors. (If you need two external 5K displays, only the 15-inch MacBook Pro can do that.) Anyway, if you work mostly wirelessly, two ports shouldn’t be a dealbreaker, but again, the other models have four. As far as performance, the new MacBook Pro feels capable and speedy. Apple is using faster 2133MHz RAM in the MacBook Pro models with the Touch Bar, but this model has 8GB of 1866MHz LPDDR3 RAM. The processor is a 2GHz dual-core Intel Core i5 (the Skylake generation) with Turbo Boost up to 3.1GHz during intense tasks. Geekbench 4.0.1 single-core CPU test. Longer bars are better. Click to enlarge. Putting it to the test in Geekbench 4.0.1, this stock, entry-level MacBook Pro racked up a score of 3765 in the single-core CPU test, and 7316 in the multicore test, both at 64-bit. But that single-core score is just 1 percent better than the entry-level 13-inch MacBook Pro from early 2015 (2.7GHz dual-core Intel Core i5 with 8GB of RAM), and the multicore score is better by 4 percent. Geekbench 4.0.1 multicore CPU test. Longer bars are better. Click to enlarge. Comparing to the entry-level 13-inch MacBook Air from 2015 (1.6GHz dual-core Intel Core i5 with 4GB of RAM), the jump is obviously more significant. This new MacBook Pro beat the Air’s single-core score by 16 percent, and the multicore score by 25 percent. Geekbench 4.0.1’s OpenCL test. Longer bars are better. Click to enlarge. Turning to Geekbench 4’s OpenCL test, which measures graphics performance, this MacBook Pro, which comes with Intel’s Iris Graphics 540 chip and can’t be upgraded, scored 28,282. That’s 51 percent better than the Intel Iris Graphics 6100 in last year’s entry-level MacBook Pro, and 56 percent better than the Intel HD Graphics 6000 in last year’s entry-level 13-inch MacBook Air. Cinebench’s OpenGL test showed less dramatic results than Geekbench’s OpenCL test. Longer bars are better. Click to enlarge. Cinebench’s OpenGL test showed graphics improvement too. Its score of 33.5 is 18 percent better than last year’s 13-inch MacBook Pro, and 33 percent better than the 13-inch MacBook Air. In the Blackmagic Disk Speed Test (version 3.0), the super-speedy storage in this MacBook Pro clocked an average write speed of 1317.8 MBps. The read speed buried the needle at 2000.0 MBps every time—the limit of this test. (We’re gonna need a bigger benchmark.) Apple says the PCIe flash storage it’s using can achieve sequential read speeds up to 3 GBps, but Blackmagic maxed out long before that. As I mentioned earlier, Apple actually included a smaller-capacity battery (54.5 watt-hours) in this 13-inch MacBook Pro, as compared to the early 2015 model (74.9). But thanks to the more efficient display and the Skylake processor, Apple quotes the same amount of battery life as before: 10 hours of wireless productivity, or 10 hours of watching movies in iTunes. I tested this by playing a playlist of iTunes-purchased movies with the screen brightness and volume set to 50 percent, and got 9 hours, 50 minutes of movie time before the MacBook Pro went to sleep—almost exactly what Apple had estimated. In daily use, I mostly juggle Safari, Mail, Messages, Slack, Byword, and Spotify, and sometimes take advantage of Sierra’s picture-in-picture feature. With this Mac, I can work a full day, taking only short breaks, and log off with 5 to 10 percent battery life remaining. Of course, the last 30 minutes or so can be a a little nerve-racking: Will I get everything done in time? I’m still not confident enough to leave the MacBook Pro’s 61-watt USB-C charging adapter out of my laptop bag, but I love how that same adapter can also charge my iPhone 7 with the USB-C to Lightning cable (which is$19 on Apple.com through the end of 2016, and $25 after that). 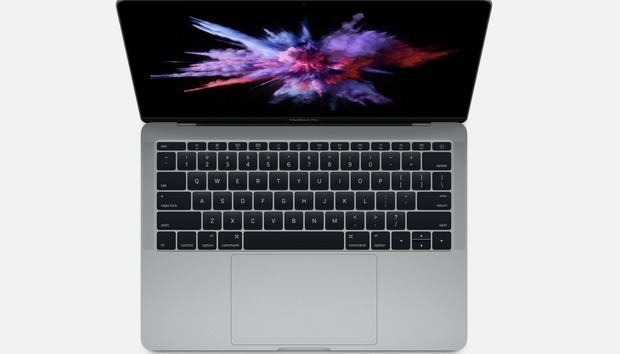 As solid as this entry-level MacBook Pro is compared to the aging MacBook Air I use day-in and day-out, pro users seeking a real MacBook Pro replacement will probably compare this model’s specs and price against the Touch Bar versions and find them lacking. The MacBook Pro with function keys has two Thunderbolt 3 ports on the left side, and a headphone jack on the right. The MacBook Pros with Touch Bar have four Thunderbolt 3 ports. First of all, this entry-level model costs $1,499, but that comes with 8GB of RAM and 256GB of storage. Simply bumping up the RAM to 16GB (the maximum available) and 512GB of storage gets you to $1,899. Fully maxing this model out with a 2.4GHz Core i7 processor, 16GB of RAM, and 1TB of storage will set you back $2,599. But you can’t upgrade the graphics at all, and you’re always going to be limited by its two Thunderbolt 3 ports. To compare, the 13-inch MacBook Pro with Touch Bar starts at $1,799, but for that $300 premium you get more than the Touch Bar itself. The Touch Bar Mac has a 2.9GHz Core i5 processor, four Thunderbolt 3 ports, faster 2133MHz RAM, and better graphics, the Intel Iris Graphics 550. The $1,799 model comes with 8GB of RAM and 256GB of storage, but it can also be upgraded to 16GB of RAM for $200 more. Maxing out the midrange Touch Bar model is $2,299, which gets you 16GB of RAM and a 3.3GHz Core i7 processor, but still 256GB of storage. A fully maxed out 13-inch MacBook Pro with Touch Bar is $2,899 with a 3.3GHz Core i7, 1TB of storage, and 16GB of RAM. We’ll have a full review of the 13-inch and 15-inch MacBook Pro with Touch Bar coming very soon.